Care Harbour Recruitment is a specialist health and social care recruitment agency serving the needs of local authority, private and voluntary clients. They search for and place candidates in temporary and permanent job roles across the UK.Their goal is to develop long-term relationships with both their clients and candidates. 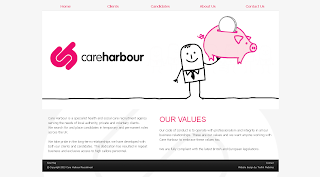 Care Harbour Recruitment specifically requested a website that 'stood out from the crowd' and looked different to the everyday recruitment site. This was achieved with a striking colour scheme and the use of illustrations as opposed to stock photographs. The illustrations make up the Sliding Header at the top of the site and are the main feature on every page. These illustrations are endearing and unique while staying relevant to the business. It is a simple yet effective design and maintains consistency and professionalism. The bright pink and grey colour scheme is also very playful and highlights all the different sections of the website, making it a comprehensive and informational viewing for interested parties. Using a simple and distinguished design such as this one can really help how the site appears on mobile devices like smart phones and tablets. This can be very influential with regards to how much traffic and interest a website generates for a business. Another interesting feature of the site are the decorated testimonials. Testimonials can be a great addition to a website and is something that we use on our own site here. They give potential clients and candidates some insight into others' experiences using your company and give your website a trustworthy persona. They can be decorated in a variety of ways. They could be contained within a templated quotation or speech bubble graphic as on Care Harbour Recruitment's site or you can make them more interesting with movement and have them scrolling up the page.